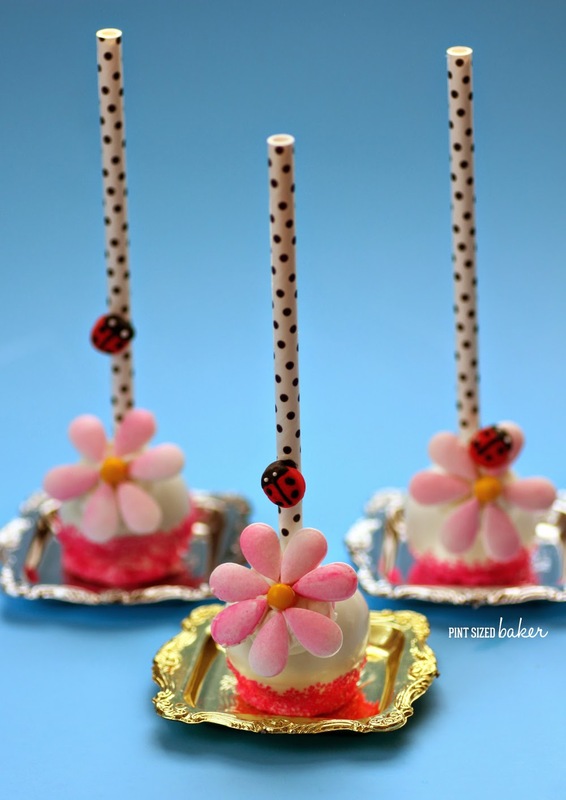 These Easy Candy Flower Cake Pops are perfect for your garden party with your little fairies. They would be so fun for birthday party favors. 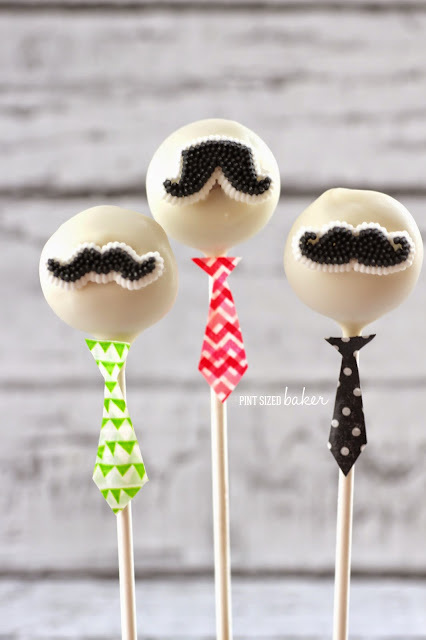 It’s time for another Wilton Cake Pop post! I found a fun candy flower kit at the store and I thought it would be perfect for a cake pop decoration. The kit was labeled for cupcakes, but whatever, they were the perfect size for a cake pop. The candies are plain white which if fine, but I added some color to my petals to really make them pop! 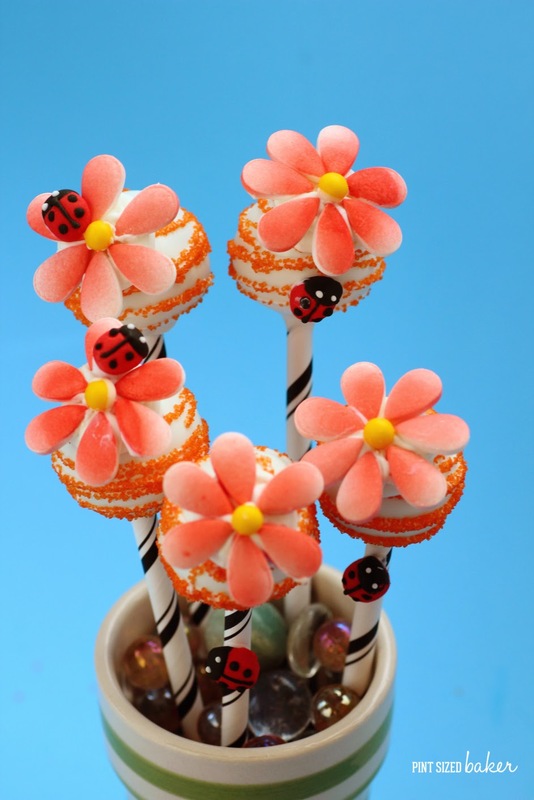 The kids are going to love these easy candy flower cake pops. Have them help you make them this weekend! I made them both standing up like a lollipop and on their bottoms like a candy apple. I thought they both looked great and would be fun for any party. Stand them up in a vase or terra cotta pot for a garden tea party, or stand them up at each place setting. Any way you make them, they are going to make a big impression! And look at those little lady bugs. They are so cute!! I just attached them to the straw with some candy melts as the glue. I got all of the supplies at my local Wal-Mart store. I looked online on Amazon and Wilton for the flower kit and I could not find it. Won’t lie, I’m kinda bummed about that. I’m not sure why it’s not online. I tried. Sorry. I just lightly colored the candy petal with red color mist and pink color mist. The red appeared a bit more orange-y, so I decorated them with orange sugar. You can color your petals as light or as dark as you like. Feel free to personalize them as you like. Wilton has a total rainbow of color mist colors for you. Making these are easy. Check out this video. Then grab to kids and have them help you! Need to know how to make Cake Pop Dough? Here’s a Video! Start by making your candy flowers. Place a sheet of wax paper down with paper towels on top of it to protect your work surface. Arrange 6 – 7 petals to create your flowers. There was enough for 12 flowers plus a few extra. Spray the flower petals with the Wilton Color Mist to tint. Follow the instructions and hold the spray can above the candy as directed to avoid speckles and drips. Set aside 24 candy melt disks and melt the remainder of the bag. Use the melted candy melts to attach the center and the petals to the candy disk. 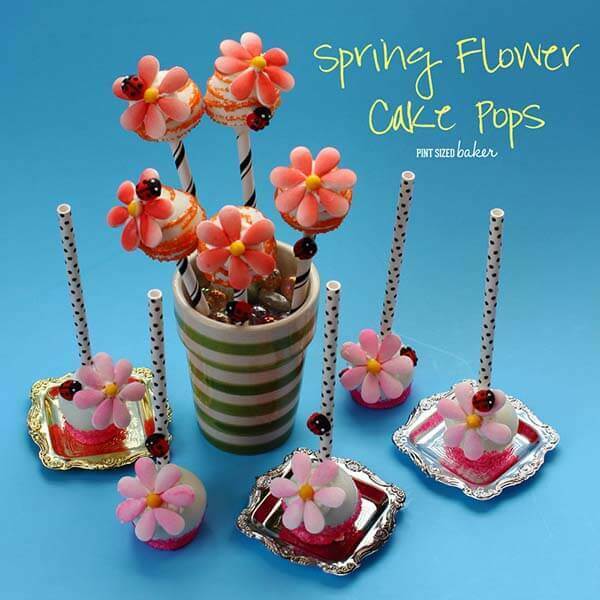 Set aside the flowers while making the cake pop batter. Use 1/4 of a 9x13 chocolate cake and a tablespoon of chocolate frosting. Mix and measure out 12 cake pop balls. Dip a straw into the candy melts, then into a cake pop ball. Complete adding all the straws first. Dip the cake pop into the candy melts and coat completely. Tap off excess and stand up to dry OR place down on a candy melt. Complete dipping all the pops. 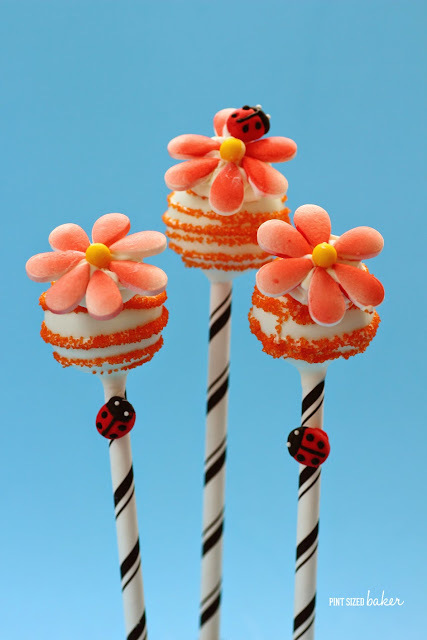 For the upright cake pops, add some candy swirls and coat in sprinkles, then add the prepared candy flower. 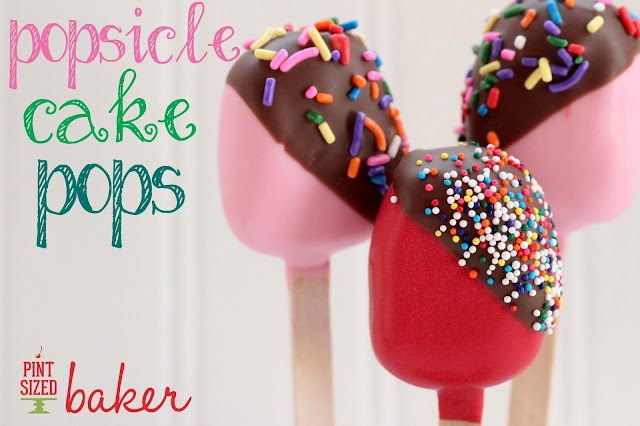 For the candy apple style cake pops, re-dip the bottom half and add sprinkles to decorate. Attach the flower with candy melts and add your ladybug candy. 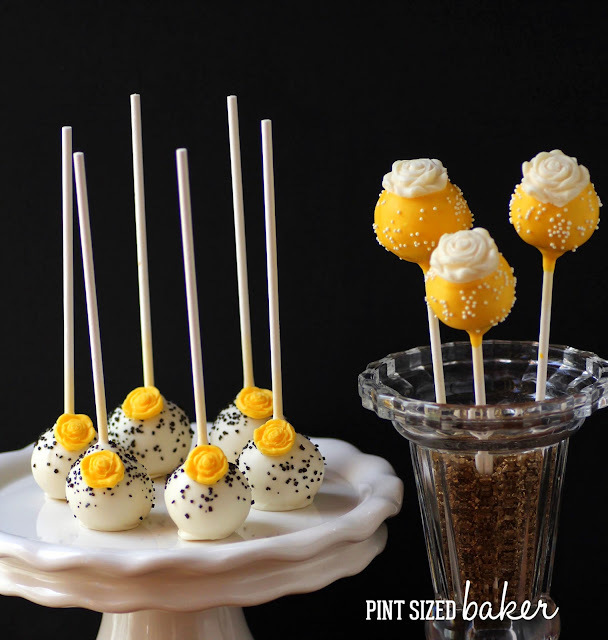 For more easy cake pop tutorials, check out these posts.